Day 306: A Wine By Any Other Name is Just an Alias! . . .
It’s Wednesday night and the day before the 237th Birthday of America. Wow! 237 years. . .it seems like a lot–that is, until you go to Europe! Italy, England, Portugal, France, Spain–spend any time on their histories and you realize that our civilization in North America is like a baby compared to our European ancestors! However, it wasn’t that long ago that we were celebrating our Bicentennial. Yep, the year was 1976 and the red, white and blue was out all over this country. It was more than just another day off, that year it was an event around every corner. Both of us were Juniors in high school, so our exact memories are not exactly in focus, but we each had moments during that amazing celebration that we remember to this day. Brian remembers (as a passenger) driving to Wichita, Kansas to watch his sister, Sharon graduate from Nursing School there. Her husband, Chuck, who was in the Air Force and stationed in Wichita, was studying for a degree in Electrical Engineering. He also remembers the thunderstorms–in case you hadn’t noticed, Wichita is located in the area known as, Tornado Alley. And, although the calendar said summer time, the weather didn’t know the difference. Literally, every night we were there, the tornado sirens went off after midnight. One of the nights, the hail came down so hard and at such an angle, that it came UNDER our door at the motel. Imagine stepping on that little gem! Thunderstorms like that are pretty rare in this part of the world, but up in that country. . .you’d better have a good cellar and the ability to sleep with one eye open! Anyway, the day before Independence Day isn’t one that garners a lot of attention, but it is noteworthy for those of us in the work world. . .if July 3rd falls on a Thursday–forget about it! Most folks either call in sick, take a day of vacation or come to work but don’t get a whole lot done. BUT, if July 3rd falls on a Wednesday (like today!) or Tuesday or Monday, well, that means work still needs to be done. . .and, you’ll get a day off in the middle of the week, but you’ll have to be back at work for the end of the week! Whew, wears us out thinking about it! 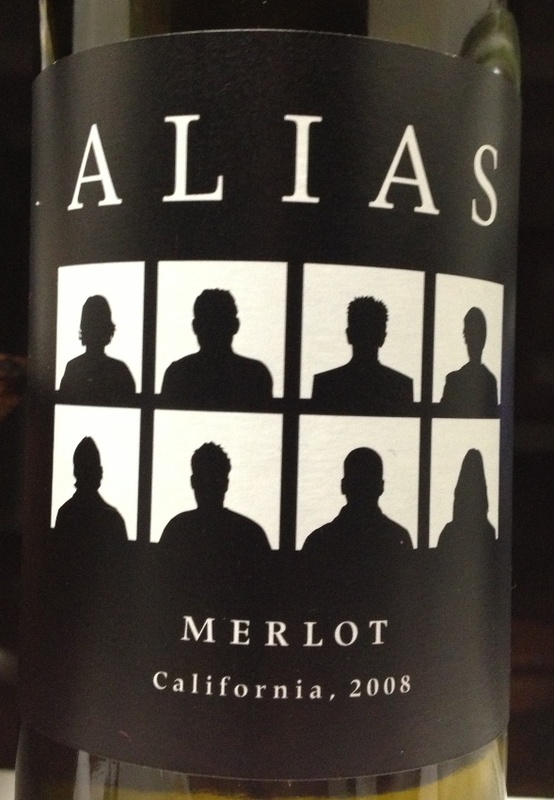 Tonight we opened a 2008 Alias Merlot! WOW! This one snuck up on us and kicked our shins! The 2008 Alias California Merlot is 80% Merlot, 12% Cabernet Franc, 5% Cabernet Sauvignon and 3% Syrah sourced from multiple California wine AVA’s. Alias is a project put together by 8 unnamed winemakers (hence the Alias name) who are attempting to make “affordable luxury” wines. The website listed on the bottle is not operational, a custom label wine company from Australia has the URL listed, so something is up, maybe a name change is in order. They source their grapes from long term contracts with vineyards and they rent space from several Napa Valley wineries to produce the wine. The color is black cherry with blood red highlights. The nose is cherry, grass clipping, butterscotch, brown sugar and blueberry. Very soft and smooth on the palate, ripe cherry and blueberry upfront, a touch of vanilla and strawberry jam following. You can sense the tannins, you can taste them, but there is no tannin bite. The mid-palate adds black licorice and tea, with a little plum. The finish is blueberry and vanilla and while the intensity fades quickly it does linger on. . .the wine is much lighter than anticipated, but the longer it was opened the more impressed we became. As wine lovers, we’ve stayed away from most Merlot wines, but this one is a keeper! Priced at less than $10 a bottle, you’ll be hard pressed to find a better wine for the money. Believe us, we’ve tried a LOT of wines in this price range, but very few, if any, have measured up to the flavor profile that this wine offers! And, whether we’re celebrating our Bicentennial or our 237th Birthday, either way, we salute our forefathers who had the intestinal fortitude to do the right thing–something that seems to be missing in large quantities today. So, as you get ready to enjoy your 4th of July, please remember to enjoy your favorite wine responsibly and recycle whenever possible!